Nonetheless, with the help of participant Binswanger Friedman, I am returning this week to thinking about Versatorium, a radical writing and education project that shares some qualities with The Public School (in LA and satellite cities throughout the US, Europe, and in Puerto Rico) and Senselab in Montreal. Like those projects, Versatorium seeks to generate non-hierarchical communal spaces for study. Its roots are in poetry and translation; its participants are multilingual and multinational including Europeans, Americans, and refugee writers and their families who now make their homes in Austria. Sometime in the early aughts, Austrian poet and translator Peter Waterhouse (whose book Language Death, Night Outside I find stunningly beautiful) started teaching a seminar on translation through the University of Vienna. This course was unusual to begin with, as it met (after the first couple of years) in an apartment off campus and was open to anyone (sometimes folks who lived in the building would stop in for a while). Discussions centered around philosophical texts and poetry, especially that of Rosmarie Waldrop, Walter Benjamin, and Ludwig Wittgenstein. Eventually this unusual hybrid — part graduate course, part community reading group — outgrew its university affiliation, but Waterhouse continued to hold meetings of impassioned translators and poets. The group acquired a new name in 2012, Versatorium, and began to work together on translations. From the start, translation was thought of as a social, never individual, project. All translations were approached collaboratively, no translation was considered “done.” The process was one of intense (and slow) communal labor. Shortly after publishing their first full (and prize winning!) 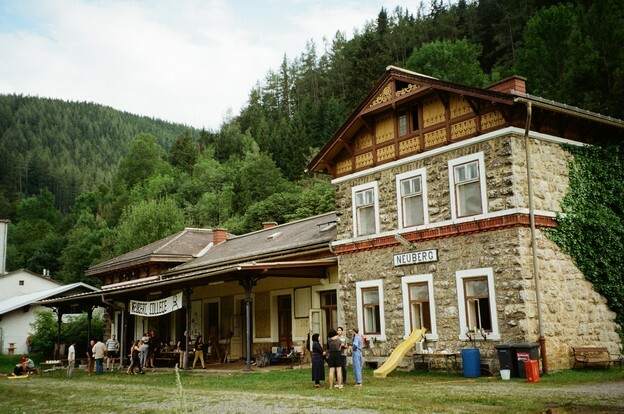 works of translation, two volumes of works by Charles Bernstein, Versatorium expanded its activities, creating what it calls Neuberg College — a free and again highly collaborative “school,” housed in an abandoned train station in Neuberg an der Mürz, Austria. The school’s “motto” is “Verein für Übersetzung der Gesellschaft,” which roughly translates as “association for the translation of society.” It takes much of its inspiration from the history of Black Mountain College, and in fact created a series of photographs in which they modeled themselves after Black Mountain participants! Courses, or more like lead discussion groups, focus on poetry, philosophy, music, architecture, and other topics, and are held in polyglot fashion. Anyone can choose to present a course and anyone is invited to take it. Last summer, Neuberg College created partnerships with Austrian agencies working with refugees from Syria and Iraq. Newly located families arrived to participate in the various informal and slightly more formal projects of collaborative study. Many of these refugees were themselves writers, poets, and performers, and brought with them not only these knowledges but also their kids, some of whom, after just a few months in Austria, were more or less fluent in German. This work into an expanded notion of community and learning in a seemingly ever-growing range of languages has led to further multilingual readings and performances, such as the traveling performance of Nobel Laureate Elfriede Jelinek’s Die Schutzbefohlenen (The Wards), which was developed with and brought to the stage by a group of refugee actors/writers and already existing members of the group. After the propulsive and repulsive experiences of January 20 and 21 and the ensuing days (only days? ), it feels important to return to the slow-going work of those who are, on modest, human-sized scales, building together the worlds they can imagine. After the anti-immigrant, anti-Muslim, and anti-refugee actions announced by the Trump regime, the work of Versatorium vibrates with urgency.